Your choice of exposure mode determines how much control you have over picture settings, including options that affect exposure, color, and autofocusing features. Set the exposure mode via the Mode dial shown here. For the most control, switch to P, Tv, Av, or M mode. 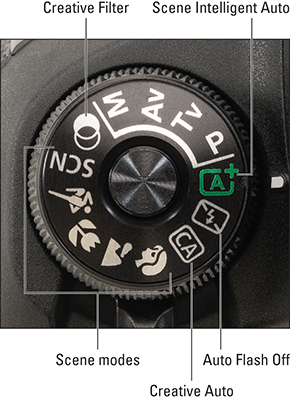 Canon refers to those modes as Creative Zone modes; the others are Basic Zone modes. Scene Intelligent Auto Completely automatic photography; the camera analyzes the scene and tries to choose settings that produce the best results. Scene Automatic modes for capturing specific types of scenes. Four scenes (Portrait, Landscape, Close-up, and Sports) have their own setting on the Mode dial. Set the dial to the SCN position to access additional scene types. Creative Auto Provides a bit more control than Scene Intelligent Auto, enabling you to adjust the amount of background blurring and a few other picture characteristics. Creative Filter Enables you to add special effects to pictures and movies as you shoot them. Tv (Shutter-priority Autoexposure) You set shutter speed, and the camera selects the f-stop that will produce a good exposure. Av (Aperture-priority Autoexposure) You select f-stop, and the camera selects the shutter speed that will produce a good exposure. M (Manual Exposure) You control both the shutter speed and the f-stop.